Going to a hotel management college is one of those moments for students which pour ample of excitement with a broad shiny smile. Excitement flourishes for rushing for early class, skipping breakfast to reach class on time, gaining insight from guest lecture, learning team work (all these activities always accompanied with a dash of fun) and a very long list of endless activities. Such is the Campus life of IHM Bangalore, an institution which has much evolved since its establishment as a Food Craft Institute in 1969 to a full time UG, PG institute. Earlier, short term courses were only offered. However, currently IHM Bangalore offers full time UG, PG, diploma and refresher courses. From being considered as dream colleges to a place of learning team work along with embracing professional skills are a few shades of its vibrant campus life. Not to mention fun and excitement is part and parcel of the campus life here. 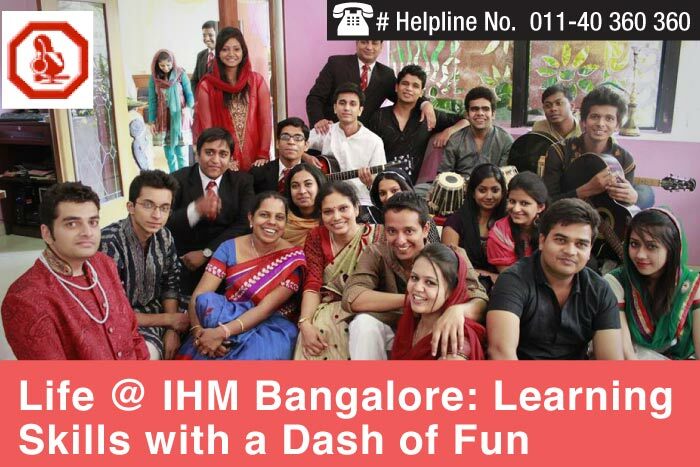 Pratima, a student, at IHM B shares that life at IHM Bangalore is fun, hard work and excitement. The course is a fair blend of professional excellence and technical know-how. Dedicating three years for pursuing the B.Sc. in Hospitality & Hotel Administration course brings lot of positive changes in the students. The course of time serves as a journey of evolution where students improve not only their professional skills but also their soft skills like communication, behavior, manners etc. Reflecting this, Ankit Joshi, a student says, “My life at IHM Bangalore has been a journey of evolution. I have witnessed a personality enhancement. Credit goes to the faculty for transforming me a professional and responsible hotel management graduate”. Seems students are mature enough to understand the value of fun while their three years of stay at the campus. There are times when short outing or weekend road trips cannot be planned due to academic activities and special projects. But, such hard times are taken as opportunities to leverage all possible advantages by learning team work. Hospitality education demands prominence to practical classes over theory. Delivering on both fronts is the USP of IHM Bangalore. Students are made to follow the daily routine strictly which sometimes become major challenge for some students in the beginning. Gaurav Bansal, astudent, shares that he faced difficulties initially on different aspects of discipline but the strict campus discipline made him pick rules and regulation to attend grooming classes, learn to utilize the short time gap squeezed between the theory and practical classes in an efficient manner and learn to don uniforms for respective classes. Besides, reporting the classroom with the applicable dress code, reaching the classes on time itself was initially a difficult task for him. Hotel management students are expected to overcome time management challenges as the quality distinguish them as potential hotelier and fit to join the hospitality sector. Another student Shubham Dey says beingcomfortable with theory and maintaining pace with high grooming standards was an enriching experience. It makes a person to value the importance of deadline and grow as a responsible person. Pursuing the undergraduate hotel management course from IHM Bangalore is an amalgamation of study schedule and internal assessment. Taking out time to hang out with friends, planning weekend trips or exploring the city is also given equal attention. As the campus is situated in the metropolitan city with some of the well known nearby places to chill out as Cubbon Park, Mantri Mall, Cunningham Road, Brigade Road, and SJP Canteen, it is fun for students to spend their weekends. Ankit Joshi says that cubbon park is a good option for students looking for a peaceful place to relax after a hectic day. The park also house a subsidized canteen where a lot of IHMians, including me, love to spend the evenings and indulging into delicious snacks and beverages. On weekends, trekking on the nearby hills is also a hit among the students. Gaurav Bansal shares, “I manage to study 2-3 hours on weekend and the rest of time is reserved for adventurous trips. I love to visit Nandi hills, which is approximately 60 km away from the city, to watch sunrise on weekends”. The institute has decent size infrastructure and is well equipped with 3 food production labs, 2 training restaurants, front office labs, housekeeping labs including laundry, etc. The institute also has spacious theory labs and Executive Development Center (EDC), where most of the practical of front office housekeeping takes place. The faculty of the college has at least 10 years of teaching experience. The IHM Bangalore faculty members have also good industrial exposure and thus they impart this knowledge and skills to students as well. Vast knowledge of the faculty helps students to learn and understand about hospitality sector in each and every possible way. Several renowned chefs frequently visit the institute to give hands on experience training to impart project planning, menu planning and design, bakery and patisserie skills to the budding chefs. Gaurav Bansal says, “Recently Spanish chef Niwlas Roman along with celebrity chef Abhijeet Saha visited the campus. The duo offered tips on Spanish cuisine”. The visiting lectures also include top most executives from different hotels sharing their ups and downs of career with students. The institute also invites industry experts to deliver speech on their job roles and achievements to motivate students. At IHM-B different student clubs to keep the students updated with industry oriented knowledge and major departments of the industry. F&B club and Food Production club focus on strengthening the knowledge base of students on areas which are not covered in curriculum. What a better way of making life practical! The students are asked to cook for themselves at the campus. Many other routine activities in the institute are also undertaken by students themselves. Second year students have the responsibility of cooking and service for five days a week to 600 people including staffs, students and helpers. There are four major departments: accommodation operations, front office, food production, and food and beverage service. Regular activities of the departments include preparation of various cuisines along with preparing desserts and serving it to the faculty in the training restaurant. One of the most prominent activities of campus is “Theme Lunch”, an event, which is organized by second year students every year. At first a theme for the event is planned along with its dÃ©cor, time and ambience. In the event many dignitaries from government and hospitality industry are invited. Every year a culinary competition titled “Mystery Basket” is held to test the skills of all the budding chefs. In addition, cultural and sports events are conducted on a yearly basis. Grooming and communication skills are of utmost importance as the course demands students to be professional at all time. Every student is required to be well groomed, presentable and well versed even at the time of attending the classes. The lecture highlights the importance and way to polish soft skills and communication standards for an overall personality development. The college is instrumental in organizing Industrial Exposure Training (IET), under which students work in the hotel for 17 weeks in all the departments to gain more practical knowledge about the departments. Further, he adds that basic virtues, to name a few- discipline, hard work, honesty, and pleasing personality are incorporated in the young trainees. Field trips or tours to winery production houses and food laboratories are also actively organized by the college. Regular notices are posted on the notice boards alerting students on all latest happenings and upcoming events. The notice allows the interested students to co-ordinate with the concerned authority. The institute also has yearly magazine titled “College day” compiled with the contribution of articles, jokes, essays, poems submitted by the students. The in-house magazine offers insight on previous year placements and alumni of the college. Stay tuned to hospitality.careers360.com for more news and feature articles on Hospitality and Tourism.